Back in Denmark I look back on a wonderfull journey to the home country of coffee. After some nice days of cupping in Addis Ababa we went to Yirga Cheffe in the southern part of Ethiopia. 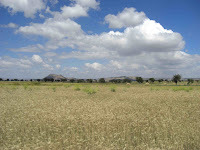 The drive from Addis to Yirga Cheffe takes approximately 6 hours. When you have passed the outskirts of Addis Ababa the land is very dry except from a couple of huge lakes untill reaching the Sidamo region. After around 4 hours of drive we reached the Sidamo region and vegetation started getting greener and more aboundant. Addis lies in 2000 mas. From there it goes a bit down to the Sidamo region which along the road is apprx. 1600 -1800 mas. After 2 hours further drive through Sidamo region at a height of apprx. 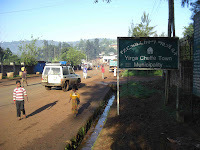 1800 mas we reached the town Yirga Cheffe, which has given name to the coffee grown around the town in altitudes between 1800-2200 mas. These coffees are after my opinion the best coffees of Ethiopia . We met with Johannes who manages the two wetmills we were going to visit. He drove us first up to a beautifull situated mill in an area called Misty Valley. 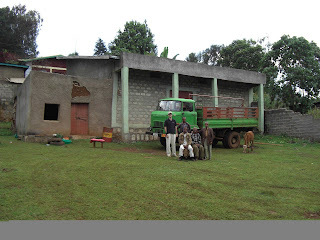 At this mill they had made the best washed ethiopian coffee I have ever tasted. I never tasted an Ethiopian coffee with such a high sweetness and even though it was also incredible clean in the taste it still had the intriguing aromas of very good washed Yirga Cheffe which to me is a combination of sweet floral notes and bergamot. At this place they had also specialized in what is some places called New Naturals. 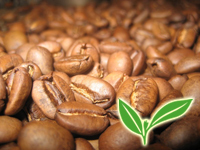 Traditionally natural coffee in Ethiopia (and most other coffee producing countries) is treated as a kind of left over product. Often it is a mix of unripe, fully ripe and overripe cherries also often less carefully selected for other defects. With the New Naturals they try to take as much care in the making of the natural coffee as they do with the washed coffee. I.e. the proces is as with traditional natural coffee where you let the cherry dry with out depulping it, but they are extremely carefull in only using the fully ripe cherries, drying the cherries very carefull and they are doing a lot of manual sorting in the proces to make up for the sortings that is possible in the washing proces. In the washing proces it is for instance possible to make a sorting of different densities which separates the fully ripe cherries and the not perfectly ripe cherries. Because of the higher percentage of perfectly ripe cherries and the carefull sorting the New Naturals from here are much cleaner and sweeter than traditional Naturals. Nevertheless a fruity flavour profile is kept though it is more controlled than in traditional naturals – which I personally often find too dirty or fermented in the flavour. 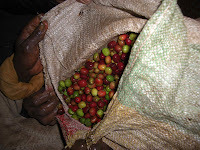 The coffee in the bag was rejected at the mill because of to many green cherries. Being there in the heart of Yirga Cheffe meeting there people who produced the wonderfull coffees we earlier had cupped in Addis having them show us around and showing us what they do was great. We also got to discus the possibilities of cooperation and what we could wish from their coming harvest. We believe that there were laid grounds for a mutual fruitfull cooperation on which we together can push the limits of coffee quality and get to present some Ethiopian coffees not seen the like in Denmark before. 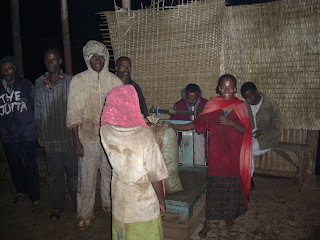 All in all it was a great experince being in Ethiopia and meet wonderful dedicated and very innovative coffee people. The coffees we tasted was from last harvest but their quality is giving me chills just to think about it. For this harvest we will be waiting for the cherries from the middle of the harvest and the New Naturals will need to dry slowly over a couple of months before it can leave the mill. Therefore we will have to wait untill the spring before we can have it in our warehouse and start roasting and cupping it – we will be looking very much forward to this date and I can promise it will not run off unnoticed! fantastic writeup mate!! I thoroughly enjoyed reading your experiences!